Uhhhh, I know it’s a mouthful, but trust me, it’s a mouthful you need in your mouthhole right now. I deserved a freaking mouthful of these after the crazy day I had on Monday. After lucking out at Hobby Lobby (they had Christmas stuff lining the aisles already–WTF!? ), Ross and a cute local consignment shop that typically has good clothes on the cheap, I reluctantly showed up to TJ Maxx, wondering if it was even worth my time to browse the usually picked-over aisles of clothes and dishes. TJ Maxx is one of those stores where half the time you go, you leave hauling dollies of bags worth of merchandise out to your car, and the other half of the time you leave there empty-handed thinking about all that time you wasted looking through useless, weird junk. Well, Monday they had good stuff. Like lots of good stuff. Cute shoes in my size, adorable Betsey belts, purses on sale and dresses(!!) that were long enough for my freakishly long torso and legs. I spotted an adorable polka dot 50’s style number and a pretty blue lace dress and raced to the dressing room, already planning outfit ideas in my head for the both of them. Everything was fine and dandy and I basically looked like a FREAKINGADORABLE Mad Men outcast in the polka dot number, so I eagerly stripped down and climbed on into the lace dress. I zipped it up the back and modeled around in it. The cap sleeves were a bit too snug and made me look like a linebacker shoving into lace. And the color (at least under the garish lights) began to look like a faded periwinkle but not in a cute way, so I decided against it and began to unzip. …until it wouldn’t unzip anymore. …until I was alone and stuck in this atrocious dress. Also, I have conversations with dresses, but usually it’s NBD since usually the dresses and I are insta-BFFs and the dress isn’t threatening my LIFE. I considered walking out to the fitting room attendant to plead for help, but seeing as I had half the zipper down and didn’t want to expose my back and bra to half the store–yes, even in the name of my life–I decided to keep calm. I closed my eyes. I breathed deeply. I chanted some dress-voodoo hexes and hoped I’d be saved. And then, miraculously, my fashion prayers were answered and I was freed. I didn’t even break seams! Afterwards, I basically hurled the dress to the fitting room lady, mumbled something about the devil possessing discount lace dresses, and thanked my lucky stars that I was purchasing a cute polka dot dress with no zippers. And then I came home and baked cookies because I’m a baking blogger and we always make cookies for no reason. What’d you expect? These cookies are inspired by my real-life BFF Dorothy and the amazeballs Deep Dish Peanut Butter Cookies she posted last week for her hubby’s birthday. 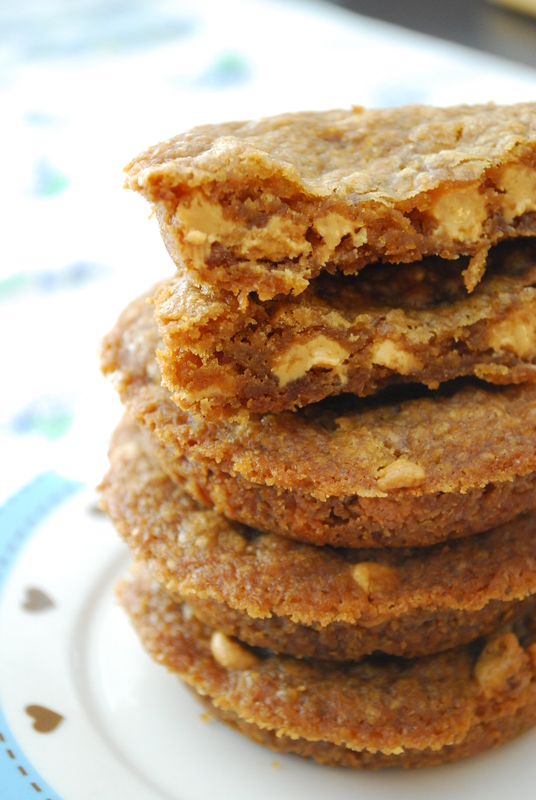 I actually had the pleasure of eating one–so buttery, salty and perfectly chewy–and knew I wanted to use the base of her recipe to make these Deep Dish Biscoff Peanut Butter Chip Cookies. I know, I know. I wanted to make sure y’all knew what this entailed. The results? My sister, who adores blondies and only blondies, said “these outdid the blondies.” That’s saying a lot. But if that means nothing to you, they’re just in-your-face awesome. And I bet if they had to, they’d totally beat up bully lace dresses for you. 1. Preheat oven to 350 degrees F. Liberally (and I mean it!) grease a deep dish cookie pan* (also known as a “muffin top pan”) with cooking spray and set aside. 2. In a large bowl, cream together the butter, biscoff, and sugars until creamy. Beat in egg and vanilla. Lastly, beat in the salt, baking soda and flour until a thick dough forms. Stir the peanut butter chips in by hand. 3. Drop about 2 heaping Tablespoons of dough into the greased cavities of the pan; press down to fit lightly. Bake cookies for approx. 9-11 minutes or until golden brown on top and edges appear set. The center may still look gooey, but that’s okay–do not overbake. Allow the cookies to cool in the pan for about 10 minutes before gently removing to wire racks to cool completely. 4. Store cookies airtight at room temperature for 2-3 days. Makes about 12 deep dish cookies. 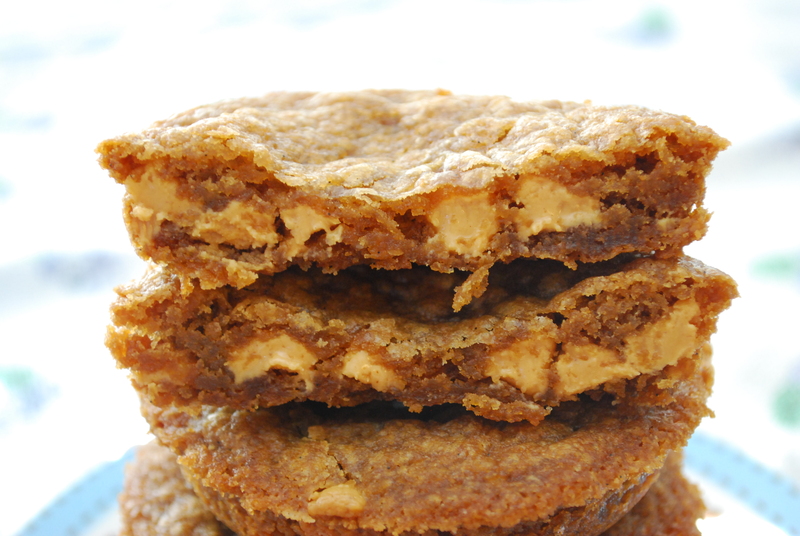 So here’s the breakdown: deep dish cookies that taste buttery and brown-sugary like a blondie with that rich Biscoff flavor, studded with vanilla beans and sweet yet salty peanut butter chips, baked until juuuuust slightly underdone for that perfect gooey, chewy bite. I’m in love. Pee Ess: Have you entered my SilPat Half-Pint Giveaway yet?! Answer one simple question–what cookie would you make with it?–and enter to win a SilPat! You have 9 chances to win! Enter HERE. Contest ends next Monday! I havent made deep dish cookies in ages…the fact that these are biscoff AND have pb chips in them, oh yes, they look so good! THANK GOD you escaped from that dress Hayley. And baking something with peanut butter is usually what I do after I have a fight with my too-tight clothes in mny bedroom. I’m a food blogger, and that’s what I do. Love this recipe AND Dorothy’s. You girls are such an inspiration! I’m toying with the idea of these with NUTELLA! OMG these would be SO good with Nutella!! hey my name is natalie and im from puerto rico i have 16 year , i im new in all this things, i love make cupcakes, and I would give you the recommendation that you will post the recipe for piña colada cupcakes their are so fun to do and are so sweet. i hope that you publish them , and keep doing the cupcakes and cookie because their are so great. If you would have gone shopping with ME I could have saved you in your moment of peril. *sigh* One day, my friend. One day. Oh, and I saw a Betsey belt the other day and almost bought it to mail to you because I know you love her and it was supercute… but then I wanted it for myself. Then I felt guilty for buying it for myself when my initial intent was to get it for you. So I left empty handed. I’m a moron. Now you know. OK, on to these deep dish beauties. I need them. I seriously need to get some cookie nutter ASAP! Lolllll I love your story! Betsey belts rock; I always see them at Ross and TJ Maxx for super cheap! Got one with a diamond-encrusted fly clasp on the front–totally rad 🙂 I have a feeling we have similar style since we’re obvi super awesome. And one day, we WILL shop together! So, out of all of the baking equipment tools I have, I don’t yet have one of these pans. I actually had one in my hand the other day when I was at Michael’s and put it back because I “didn’t really need it.” But I think I do, in fact, need it. These look amazing! 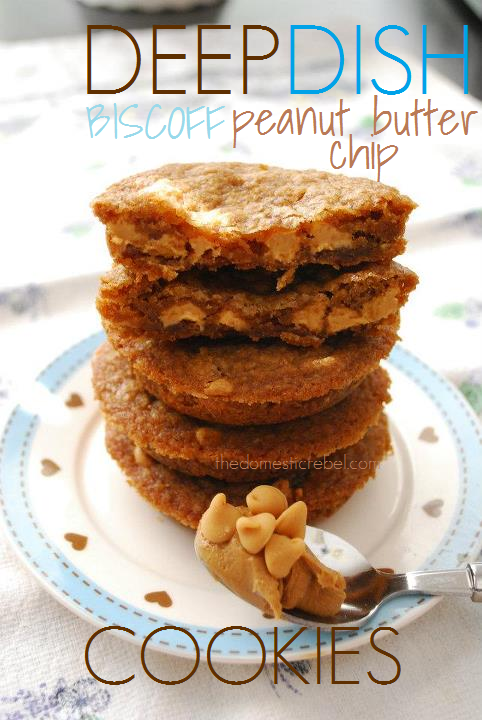 And with the Biscoff–yum! I’m on a Biscoff spree now that I can finally find it here in my stores! Think of all the deep dish cookies you could make! It’s my new favorite pan–outdoing my prior fave, the donut pan. So awesome! These look amazing! But if I wasn’t quite ready to get one of these pans, do you think they would come out ok as regular cookies made on a cookie sheet? Any alterations to cooking temp/time??? I seriously LOVE it, too! These cookies are awesome–I hope you like them! Oh no! I’m sorry to hear they were flat 🙁 boo! I love my muffin top pan and only got it for $8 on clearance at Sur La Table, but in general, they’re usually under $15! Either way, I’ll look into the recipe to see if there’s an error on my part. I’m glad the flavors were good at least! don’t worry…my coworkers LOVED them (ok, and so did i). we gobbled up those flat cookies, so it wasn’t a total loss! i just felt like i had to report back to let you know that i made these in one of those spiffy pans (that i got for about 6 bucks with a 50% off coupon at michael’s!) and…WOW. just…WOW. absolutely amazing. and i’m glad that this recipe forced me to buy one. absolutely worth it! thank you!!!! Do you think these could be made into “cookie cups” by baking them in a cupcake pan? Thanks for all the awesome recipes! I made these today as a treat for some friends who just had a baby! They are SO DELICIOUS!! Mine turned out a little salty so I added some Bischoff buttercream frosting with pb chips sprinkled on top. They were out of this world! Thank you for this recipe! It’s going in my regular rotation!